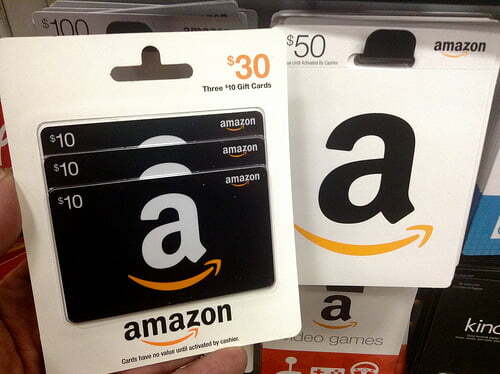 If you have a credit card, you can buy a gift card directly at Amazon. You can receive these cards via email or regular mail. You can even have them sent to someone else with a personal note or in a nice gift box. Note: an Amazon Gift Certificate is only valid in the store where you bought your gift card for: If you buy a card for Amazon UK, you can only use it at Amazon UK. Same applies for the German and French stores. 3. Log in with your Amazon account details or create a new account. 4. Enter your code and the value will be added to your account balance. How to buy Amazon Vouchers without Credit Card. At Amazon, you can only pay with a credit card or with a local debit card (on some country-specific sites). If you want to buy a gift card without a credit card, read here how you can buy Amazon Vouchers here all Amazon sites (France, Germany, Italy, Spain, UK, US,…) with a debit card, Bitcoin, PaySafeCard, iDeal and dozens of other online payment methods. Make sure you buy the gift code for the Amazon shop of your choice.